Ankles can pop for many reasons mostly involving the injury of one or more of your joints in the ankle. In some cases though, ankles may pop even without injury. Whatever the case, experiencing your ankle pop may make you worry if you have a serious condition. Likely, you have an ankle sprain and one or more of your ligaments in your ankle is sprained. Aside from this common cause, there are three specific causes for your ankle pop. Why Do My Ankles Pop? 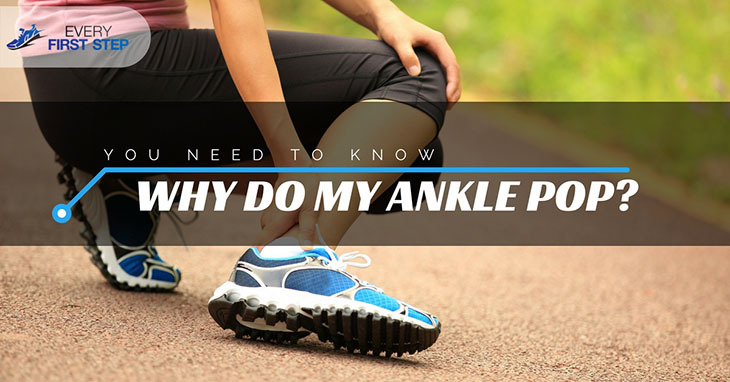 This is the most common cause of ankle popping and is happens due to ankle ligament injury. The ankle has two ligaments- one on the inside which is more important and often torn only if seriously fractured. Ankle ligaments get twisted when your sole points inward or downward instead of flat on the ground. When this misbalance occurs, only one or two of your ankle ligaments are carrying your entire body weight. Although it is not common, there are some cases wherein the bones of your ankle may end up broken or pieces of joints inside the surface ankle may be chipped off. In other instances, ligaments connecting your bones may be torn. If the ligaments in your ankle fail to heal properly, this may cause long term problems. One example of this is when the small nerve endings in your ligaments are damaged. This is also referred to as OCD (Osteochondritis Dissecans) which is a condition that develops when a bone segment separates from its surrounding bone because of lack of blood supply. The reduced blood flow is said to be caused by trauma possibly by small minor injuries to the bone. Children and adolescents are at higher risk of this condition. ​There is also a similar condition in which there is a lesion of a joint called sporadic Osteochondritis dissecans. This condition is often caused by sports-related injuries. The personals are muscles that are attached along the outer edge of the lower leg. They have tendons called the peroneal tendons which run behind the outside ankle bone. When injured, they may snap out of place. An ankle sprain is the most common cause of peroneal tendon subluxation which can be caused by sudden movement of your planted foot causing misbalance. When you suddenly change your running surface, you may also experience this condition. Some people also may suffer from a stress fracture which may cause pain when the foot is placed on the ground. A stress fracture is often experienced in the lower part of the tibia and also causes pain when walking. Although stress fractures are caused by a crack in the bone due to overuse and not a snapped tendon, the symptoms are quite similar. Depending on the cause of your popping ankle, there are different methods used to cure the condition. Although in most cases, surgery may not be necessary, it may be recommended by your physician if the ligaments are severely damaged and the condition does not improve. The following are the most common kinds of surgery. This helps your ankles have more control even when your weight shifts. To do this, stand with your feet about a hip-width apart, shift the weight into your toes and lift your heels off the ground. Similar to calf raises, this exercise helps you maintain your control. Like the calf raises, raise your toes off the ground. This helps to improve the range of motion of your ankle. Sit upright and raise your ankle above the ground and spell out the alphabet. This also strengthens the ankle. Stand on your one foot and bend your knee holding it for up to 30 seconds. You can also prevent having future problems by taking care to wear supportive shoes. Shoes that are worn can cause an uneven step which in turn may trigger ankle issues. Another suggestion is to stick to even running surfaces and steering away from uneven surfaces which may cause an uneven step. Gradually increasing your pace and maintaining a healthy weight are additional suggestions that will not only prevent an ankle pop but also other foot issues such as h﻿﻿eel bru﻿﻿ise﻿﻿s. Experiencing popping ankles doesn’t have to be a big issue that prevents you from running if you know how to identify the cause the popping. As discussed, having an unstable ankle, having a loose bone formed or having a snapped tendon. In most cases, a sprained ankle is the cause of the popping in your ankles. If you have identified the cause of your ankle popping, you can easily follow the recommended first aid methods of treatment including ice compress, compression and the like. In extreme cases, surgery may be necessary in order to correct the underlying issue. How did you enjoy this article? Have you ever experienced your ankles popping during your run? We’d love to hear your ideas in the comments below? Please feel free to share your thoughts. Also, feel free to share this information with friends and family.